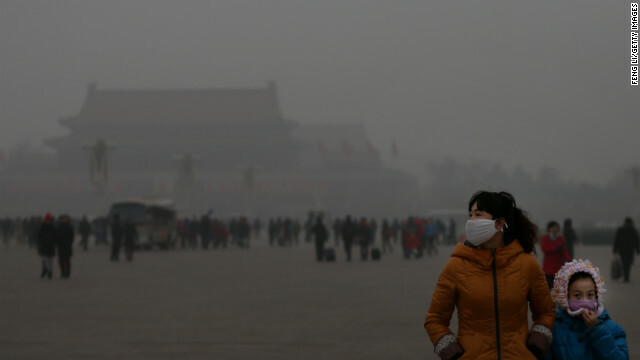 Reminder: why China would support efforts to reduce carbon-based pollution. To kick off this discussion, a funny question: Why would "Communist" China support carbon reductions while the American Republican Party would not? Weird thinking about that, huh? The answer is that China is beginning to understand that health is a vital component of stability, something the Communist Party desires above all else. It has, in the past, killed its citizens for stability. It's getting to the point, though, where China would rather win over its citizens with policy, not oppression. Why? The potential for revolution never goes away, regardless of how you work to cleanse the dissidents. Good paychecks, full tummies, and good housing -- and, yes, good health -- can be cheaper and easier than maintaining vast police states. Also, too, life is better, and with it so is productivity. The Republican Party has different priorities. As long as "it's a job killer!" polls well, regardless of the silliness of the rhetoric, Republicans will shill for the corporations and the U.S. Chamber of Commerce. It's the profit, stupid. Political Animal points out that a carbon tax could work, if it was coupled with reduced taxes elsewhere. Making the idea attractive to Republicans is hard, but what if the corporations could get in on the tax tradeoff, as well? This Bloomberg View article on how to sell a carbon tax makes sense: Use all of the revenue from a carbon tax to reduce taxes elsewhere. Republicans might buy into that one. The tax would run from pretty hefty all the way to an earned tax credit. If you want to eat carbon, so be it. Have at it, but be prepared to pay the tax. If you want to reduce your carbon consumption to zero or even better, so much the better. Corporations and private individuals would both have an opportunity to reduce their tax rates by dumping high-carbon-use practices. If you are rich and want to own five cars, great. Pay the tax. If you're middle-class, live in the city, and don't have a car, great. Your taxes drop. If you own a certified "green" car -- electric, hybrid, low-mileage diesel, etc. -- you pay a reduced rate, depending on total carbon footprint. If your home is certified green -- meeting certain insulation standards, green appliances, etc. -- your taxes go down further. Have solar panels? Down go your taxes. At some point, taxpayers are green enough to actually receive income from going green. If properly structured, a carbon-footprint tax scheme could fight income inequality: If the rich want to live high on the hog, let them subsidize the poor or green-savvy citizens who would love the tax breaks, even credits. I'll keep it simple for now. But imagine a world in which income distribution flows to more normal levels, while carbon is reduced further and further. If the rich resent high taxes because of their carbon-rich lifestyle, stop using carbon! The rich can't say, "We earned this money!" Of course you did, we're only taxing you because of the reckless way you're spending it. Keep your money if you want! Go green! From a political standpoint, it's hard to attack the rich for being stinking rich. It's easier to attack them for being stinking polluters. Lifestyles of the rich and famous give your children asthma. That's a better campaign than give me some of your money! A quick counter-counterargument in advance: This would be bad for the economy. No, it wouldn't! Companies that play to pay a lower carbon tax would lower their tax burden. Those that build greener plants, office buildings, low-emission fleets, etc. lower their tax overhead, which will match the cost of going green. If enough companies do it, the cost of solar, wind, electric cars, batteries, etc., etc., will drop while these green industries grow the economy along the way. Who loses? Okay, there are losers. The oil companies. The coal-mine operators. The natural gas producers that can't adequately reduce leakage of methane (not technically carbon, but must be in the mix). But these companies have been running ads for years about how green they are, how they're with us humans who want to grow, thrive, and survive. Now they can walk the walk: Invest your billions now in green systems. Nobody is stopping ExxonMobil from becoming the largest swappable electric-car-battery operation in the world. Nobody is preventing Chevron from becoming the world's largest producer of biodiesel. BP can become the largest distributor of hydrogen, with the most hydrogen stations in the world. You get the point. These ideas aren't crazy. They're innovative, and they lead to jobs, healthy workers, and higher productivity. The countries that get on-board will lead and thrive. Those who don't will be left behind and will end up scrambling to get a piece of the action in a reduced-carbon world. They'll look more like Beijing than Stockholm. C'mon, it's good business. Republicans should be first in line. ExxonMobil wants to solve our energy challenges. We're with you, if you're for real. Here's a link to a site that has thought about this, right up to including dividends (revenue distribution).